This fascinating book by Richard Gray is an exploration of the history of the cinema building in Britain, from its 19th century origins right up to the present day. The earliest cinemas were little more than shop conversions or basic rectangular rooms. As film-going grew in popularity during the World War I period, and later with the arrival of the ‘talkies’ from Hollywood in 1928, there was a great surge of new building, with cinemas becoming far more complex in style. The movie palaces of the 1920s and 1930s – the heyday of cinema – could seat as many as 4000 people and often featured fantasy interiors, styled for example after Egyptian temples of Gothic cathedrals. With the arrival of television in the late 1940s, however, cinema audiences began to dwindle, and a new type of building with several, smaller auditoria became necessary. The recent resurgence in the popularity of film-going has accompanied, or even been boosted by, the arrival of the ‘multiplex’. At the same time, an increasing recognition of the architectural importance of these often magnificent buildings has so far led to around 120 British cinemas being granted listed status. Thus they have been preserved for future generations. Cinemas in Britain evokes the unique magic of cinema while providing a fascinating architectural history. 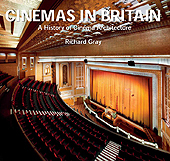 Further details of Cinemas in Britain: a history of cinema architecture can be found on the main catalogue, available in ‘Catalogues’ on the Library’s website.